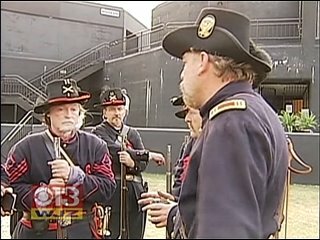 From WJZ-TV in Baltimore, Maryland. MORGANTOWN, W.Va. (AP) — There are battlefields, and then there’s Belle Boyd, teenage temptress and Confederate spy. The Appalachian Regional Commission is betting Boyd is the sexier Civil War story and that tourists will want to visit the Martinsburg, W.Va., home of the notorious “siren of the South” who used her feminine charms to spy on Union soldiers for the Confederacy. The Belle Boyd House in the Eastern Panhandle is one of 150 lesser-known Civil War destinations the commission is highlighting on a new 13-state map that was released Thursday, pointing the way to that footnote on history and plenty more. Timed to coincide with the 150th anniversary of the war, the guide is aimed at helping states cash in on the growing popularity of cultural heritage tourism and to get those tourists beyond such well-trod battlefields as Gettysburg, Pa., and Antietam, Md. “Our story here is that there are a lot of jewels in Appalachia, and a lot of great stories about families and communities that we should stop and take a look at,” said the co-chair of the federal agency, Earl F. Gohl. The map and guide were released at Independence Hall in Wheeling, where some Virginians were so horrified by talk of secession when the war erupted in 1861 that they held their own constitutional convention and formed the breakaway state of West Virginia two years later. Boyd, who once boasted in a letter to a cousin of her 106-pound “beautiful” form, supplied Union secrets to Stonewall Jackson, who made her a captain and honorary aide-de-camp. She was arrested and imprisoned twice, then released while suffering from typhoid. The Confederacy sent her to England as a courier, but she was captured before she could complete the mission. Historians say she eventually married a Union naval officer and lived in England until 1866. Boyd published a memoir and worked as an actress, then became a lecturer. She died in Wisconsin in 1900, on a tour touting her adventures. Her story is one of many that are often missed, says Gohl. The new guide hopes to draw back the curtain on her house and other locales. Those include Mississippi’s Corinth Contraband Camp, where slaves fleeing Southern plantations sought refuge with federal troops. Union Gen. Grenville Dodge took them on as teamsters, cooks, laborers and eventually, security officers. That led to the creation of the 1st Alabama Infantry Regiment of African Descent. Then, Gohl says, there is Altoona, Pa., where President Abraham Lincoln convened the states’ governors and consulted on the Emancipation Proclamation. The guide will be a free insert in the spring issue of American Heritage magazine, and copies have been distributed to tourism agencies in West Virginia and the 12 other Appalachian states — Alabama, Georgia, Kentucky, Maryland, Mississippi, New York, North Carolina, Ohio, Pennsylvania, South Carolina and Tennessee. Edwin Grosvenor, editor in chief of American Heritage, said the map has more information and more stories than many magazines, and those stories help make the Civil War relevant to new generations. Many schools have stopped teaching about the conflict, and over the past few decades, he said, visits to even famous destinations such as Gettysburg have dropped some. Although there is enough Civil War history to fill a library, Gohl said relatively little focuses on the lives and lifestyles of noncombatants between 1861 and 1865. The commission and the states opted to focus on farms and factories, railroads and restored houses, even a sprawling cave where soldiers hid out for three years. “There’s another story here — how people lived, how culture developed,” Gohl said. Kentucky’s Mountain Life Museum in London features seven pioneer settlement buildings filled with relics from that agricultural era. At the Gordon-Roberts House in Cumberland, Md., visitors can learn from Priscilla McKaig’s journals about her son’s enlistment in the Confederate army. In Ripley, Ohio, tourists can see where ardent anti-slavery activist John Rankin — a Presbyterian minister — sheltered 2,000 slaves escaping to freedom via the Underground Railroad. And in South Carolina, they can learn how James Clement Furman opened his Greenville college to women when the men went off to war. They paid their tuition with bacon, sugar and lard. This is the third tourism map the ARC has created, with others focused on thematic driving tours. Surveys done after those projects suggest the value of a relatively small investment in the latest map — $9,000 to develop and 12 cents apiece to print. After the previous projects, Gohl said, surveyed destinations reported a 15 percent to 50 percent jump in visitation. “This is an approach that works,” he said. The U.S. Travel Association estimates tourism is a $704 billion industry, and the cultural heritage sector is growing at twice the rate of the overall market. Appalachia is home to six of the 10 most-visited states in that sector. Although West Virginia’s Civil War offerings are relatively well known and within a day’s drive of much of the East Coast, Tourism Commissioner Betty Carver said most people still visit for outdoor recreation. But now the outdoor adventurers themselves are looking for historic sites and other attractions to complement the thrill of rock climbing and rafting. The new map, Carver said, “raises the profile of West Virginia by putting our sites right there alongside the other states.” It also supports places the states are already marketing, like the 10-room Belle Boyd house, already part of West Virginia’s Washington Heritage Trail. Inside, visitors will find tea pots, cookie jars and tales of Belle Boyd’s intrigue. An ancient Chinese legend tells the story of a young woman, Hua Mulan, who lived during the Wei dynasty. It is said that when Mulan turned 18, she enlisted in the all-male army to fight against the nomadic Mongolian tribes who threatened China. She went in place of her father, who was too old and her younger brother, who at the time was too young, to serve. She was offered a title in honor of her service, but turned it down, returned home and lived out the rest of her life, dying of old age, not war service. In years to come, the legend of Mulan would become a reality as women began to go to war disguised as men to fight for a cause they believed in. By doing so, they too bore arms, lived in germ-ridden camps, experienced capture and prison camp incarceration, and many times died for their cause. The Civil War is ripe with stories of women who did just this – on both sides of the conflict. Though both the Confederate and Union armies had a standing rule against women enlisting, it did little to deter the intense desire of many patriotic women who were unwavering in their desire to serve. In an effort to circumvent the rules, women were forced to disguise the fact they were female and assume masculine names. Due to this fact, it is virtually impossible to calculate exactly how many women truly did serve in the military. In some instances, the woman’s gender was revealed due to casualty or accident. Mary Owens, for example, was discovered to be a woman when she suffered a wound to her arm and was sent back to her home in Pennsylvania where she received a warm welcome. 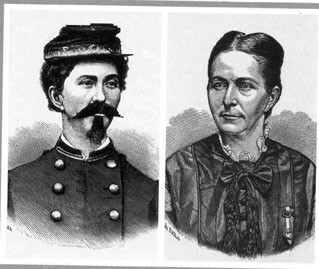 Prior to the discovery, she had served in the Union Army for 18 months wearing the name John Evans. Sarah Rosetta Wakeman was another of the many women who served undercover. Born into a large family and raised in the dairy country of New York, she left home at the age of 19 to seek work. Given the fact women of her time had few career choices, none of which offered a suitable wage, she changed her name to Lyons and assumed a male appearance. By doing so, ‘he’ was able to obtain work on a barge and earned a large enough income to allow him to send a portion of his wages home to his family. So convincing was Lyons’ deception, ‘he’ was approached by recruiters to join the Union Army. The $152 sign-on bonus was too good to pass up, so Lyons agreed and served in the 153rd NY State Volunteers. Lyons served for two years and participated in a great deal of combat. Eventually, the stress of war proved too much for Lyons, who reported to the regiment’s hospital with a chronic case of diarrhea on May 3, 1864. On May 22nd, Lyons was transferred to New Orleans and died on June 19th. ‘He’ was later buried in the Chalmette National Cemetery under the name of Private Lyons Wakeman. Due to the fact both the Union and Confederate Armies denied women the right to enlist, neither held any regard for those who did. On October 21, 1909, Ida Tarbell, a writer for The American Magazine, sent a letter to General F. C. Ainsworth, who was at that time the adjutant general. In her letter, she sought an answer to the question of whether or not he was aware of how many women had actually enlisted and served in the Civil War. A short time later Ms. Tarbell received a reply from the Records & Pension Office (a division of the Adjutant General’s Office), signed by Ainsworth. In his response, he stated no official records were available to indicate any women had served, either in the Regular or Volunteer Army, during any period of the Civil War. He did accept the possibility some may have slipped in unknown for a brief period without it being known they were women; however, no record of such occurrences were listed in the official files. General Ainsworth’s statement was later proven to be totally false. One of the major duties of the Adjutant General’s Office (AGO) was to maintain the archives of the U.S. Army. Great care was taken by the AGO to do just that. When the compiled military services records (CMSR) of 1909 were referenced, documentation regarding the service of women soldiers during the Civil War was indeed available. When history studies the efforts of the women soldiers who served during the Civil War, the title ‘trailblazer’ is definitely appropriate. Their determination to serve the cause they believed in set a high standard for today’s service women to uphold and carry on in their respective military branches.